A member of the famous Dalton Gang, Jim Nite was the one caught after the robbery. This is an exact copy of the actual murder indictment that was found in the vertical files of the Genealogy Department of the Longview Public Library. In the District Court of Gregg County, Texas, December Term A.D. 1899. Now comes the defendant Jim Nite, in the above styled cause and says; 1st - That there exists in this County of Gregg, where the prosecution against him is commenced so great a prejudice against him that he can not obtain a fair and impartial trial. 2nd - That there is a dangerous combination against him instigated by influential persons, by reason of which he cannot expect a fair trial. 3rd - Defendant says that he is informed that on the 23rd of May 1894, the First National Bank of Longview was robbed by four men that during said robbery a large number of shots were fired by both the bank robbers and the citizens of Longview. That the altercation between the bank robbers and citizens of Longview lasted about twenty minutes during which time continual shooting was going on the bank robbers using heavy needle winchester rifles of 38 and 44 caliber; and that during said altercation George Buckingham and Charlie Learned good citizens of Longview, Texas, were killed by the bank robbers, and that J.W. McQueen a citizen of Longview, Texas was shot through the hip by one of the bank robbers and thereby rendered a helpless cripple for life and that ______ Summers, a farmer living near Longview was shot through the hand by one of the bank robbers, and that one of the bank robbers was killed by the citizens. That during the bank robbery a regular battle was entered into between the bank robbers on one side, and the citizens and officers of Longview and Gregg County on the other, with guns and pistols and the said battle was kept up until the bank robbers made their retreat out of town. That immediately after said bank robbers got out of town, numerous possees of men were gotten together for the purpose of persuing said bank robbers and for the purpose of cutting them off. That the railway Companys having their roads running out of Longview immediately extended free transportation and ran out extra trains for the purpose of carrying the possees of men. That the number of men sent out in possees amounted to more than one hundred. That from the beginning of the bank robbery for one or two weeks nothing but the wildest excitement prevailed all over Gregg and Harrison Counties. The District Court of Gregg County was in session at the time of the bank robbery and the Judge presiding over said Court was compelled to adjourn Court for the week and publicly announced that on account of the excitement Court would stand adjourned until the following Monday morning, the bank robbery happening on a Wednesday afternoon. That on the opening of the Court on the day to which it was adjourned nothing scarcely was done on account of the excitement and the Court soon closed without doing much business. That all the business of the town of Longview virtually ceased for about two weeks, and the farmers of Gregg County pretty generally stopped their work on their farms and come to Longview every day and there were crowds of people in Longview every day for about two weeks engrossed in the wildest excitement. That immediately after the surviving bank robbers left Longview, on the day of the bank robbery, there were about three thousand men, women, and children on the public square in Longview and on the streets contiguous thereto in the wildest of excitement. That some of the citizens of Longview and surrounding Country took the body of the dead bank robber and placed a rope around his neck and dragged him through one of the main streets and through the public square a distance of about four hundred feet to a telegraph pole and drew him up a distance of about 25 feet and held him there suspended for about one hour during which time the wildest excitement prevailed and the crowd of people were yelling. That said persons dragging said lifeless body dragged it with a rope through the dirt, regardless of whether the bare face, head or neck was grating against the earth. Defendant says that the bank robbery was committed in a a daring manner, and in a manner most likely to stir up the highest character of feeling. 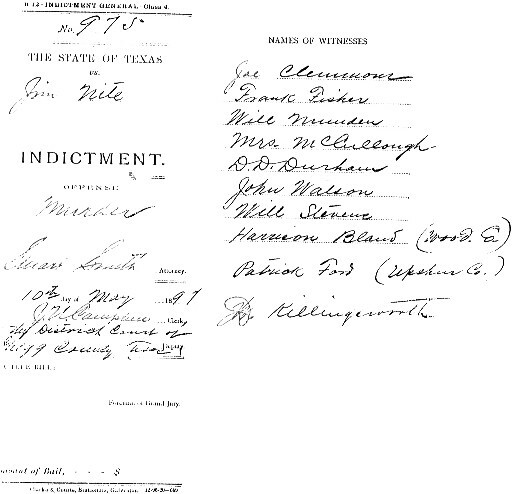 Defendant says he was arrested on the charge in this case on or about the 7th day of February, 1897 and that ever since his arrest he has been commonly known as the "bank robber" and his case in the District Court is not commonly known as "Jim Nites" case but is commonly known all over Gregg County as "The Bank Robbers" case. And that ever since his arrest different reports have been circulated about him to his detriment. That it has been recently reported that he was to be rescued from the officers of Gregg County. That the reason of said reports the Longview Rifles, the military Company of Longview, have been stationed at the County Jail, where defendant is being confined for the past three weeks all for the purpose of keeping your said defendant from escaping or being rescued. That your defendant has to-day been marched to the Court house in charge of said military Company and Capt. McDonald and two of his company of the the Texas Rangers around with winchesters all of which is noticed by the public, and which has its effect to his detriment. That the Court house is now packed to overflowing with excited people eagerly watching this case, and that the extra large crowd now at said Court house came here because of the ascertaining this to be the day this defendant was to be tried. Defendant says that he is informed that threats have been made that if a change of venue is granted in his case that he will be mobbed by the citizens before he can safely be carried out of Longview. He further says that for several weeks every stranger that has come to Longview or surrounding country has been closely watched to ascertain whether or not they were here to assist your defendant to escape or rescue him. That in the last few days, Capt. McDonald with some of his rangers have been sent here to watch the strangers and prevent any one from assisting your defendant to escape or from rescuing him. Defendant says that Gregg County is a small County, being only about 15 miles across east and west and about 22 miles North and South and that Longview is a place of about 4500 people situated about half way between the North and South and on the East side of said County, and is attainably situated from every point in said County. That Longview is the only town of any size in said County and about half the people of said County live in said Longview and the majority of the remainder live in the Country contiguous thereto. That all of the matters hereinbefore set out are known all over the County of Gregg and are considered by the people detrimentally to the defendant. Defendant says that the officers and stock k holders of said First National Bank of Longview and all the killed and injured parties at said bank robbery have numerous friends and relatives in this County while your defendant has none, and your defendant is informed that several witnesses who are residents of Gregg County will testify that they recognize him as one of the bank robbers, participating in the bank robbery on May 23rd, 1894, that your defendants defense is an alibi; and that the witness he depends upon to prove his whereabouts on that day are not residents of Gregg County, Texas, and are not known in said County and all of the State witnesses are well known in said Gregg County giving the State a decided advantage over him. Defendant says that by reason of the premises hereinbefore set out every qualified juror in Gregg County is more or less excited in regard to his cause and is prejudiced against him and biased in favor of the State, whereby he cannot get a fair and impartial trial. 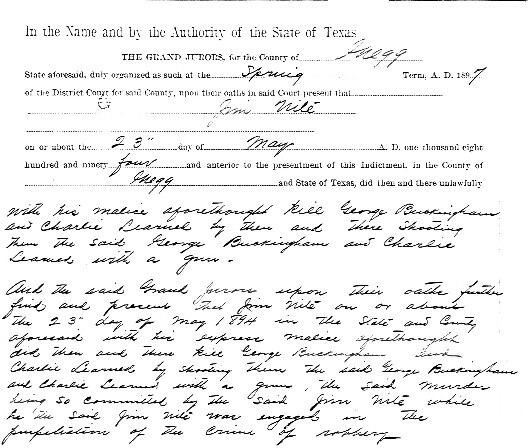 Defendant says that the citizens of Gregg County are so eager to have him tried here that he can not get any compurgators to sign an application for a change of venue with him, and the here now makes oath to the foregoing and asks this Court to change the venus of this case of its own motion. Sworn to and subscribed before me on this 27th day of December, 1897. (L.S.) Clerk of the District Court of Gregg County, Texas.